I miss fresh summer berries. Even though all the grocery stores in my neighborhood carry blueberries, raspberries and cherries this time of year, the taste just isn’t the same. (Likely because any berry you can find in Brooklyn in January comes from a land very far away). I could live on blueberries alone in July. In August, wild raspberries abound in my mother’s garden, and I eat them right off the bush. And cherries—well, I’ve been known to eat them by the pound. Berries are wonderful pops of sweetness in your mouth. They taste like summer, too. It’s a good thing I’ve gotten to like winter vegetables so much, because I’m quite tired of winter fruits. And on this rainy and cold day, I could use a taste of summer. Enter frozen berries. Yeah, I know—they’re not the same as fresh, but they’re picked and frozen in season. And when you cook them, their flavors concentrate—particularly well with the addition of Grand Marnier and honey—and summer has arrived. Berry sauce is ridiculously simple to make and takes about 30 minutes of largely unattended time. 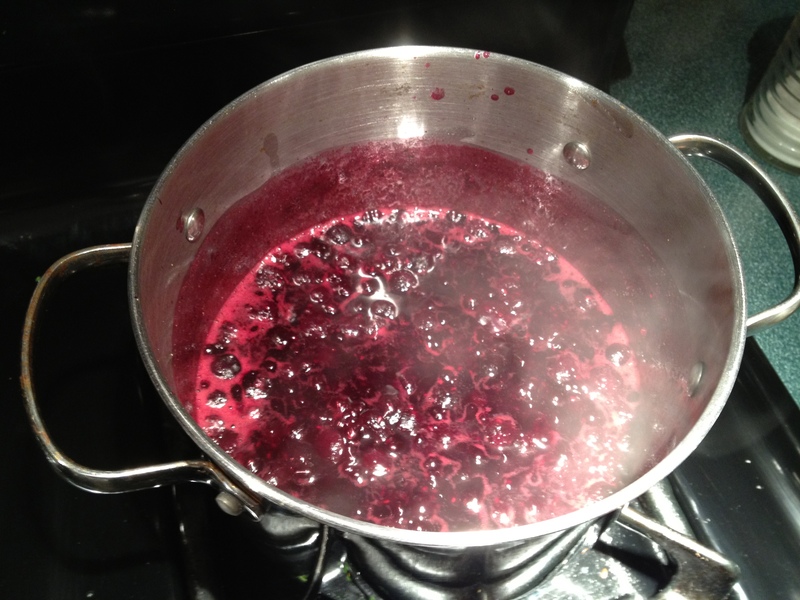 Four ingredients thrown into a pot, brought to a boil, then reduced to a simmer until the mixture cooks down to a texture that’s half jam, half syrup. It’s delicious right out of the pot, or spooned over cake, yogurt or ice cream. Once the mixture has boiled for 2 minutes, reduce heat to a simmer for 25 minutes or so, until the mixture has thickened and reduced by half. It will continue to thicken as it cools. This recipe will yield 1.5 cups. Serving size is 2 tablespoons, so there are 12 servings. Spoon over toasted Angel Food Cake. Mix with Greek yogurt and top with a sprinkle of granola or sliced almonds. 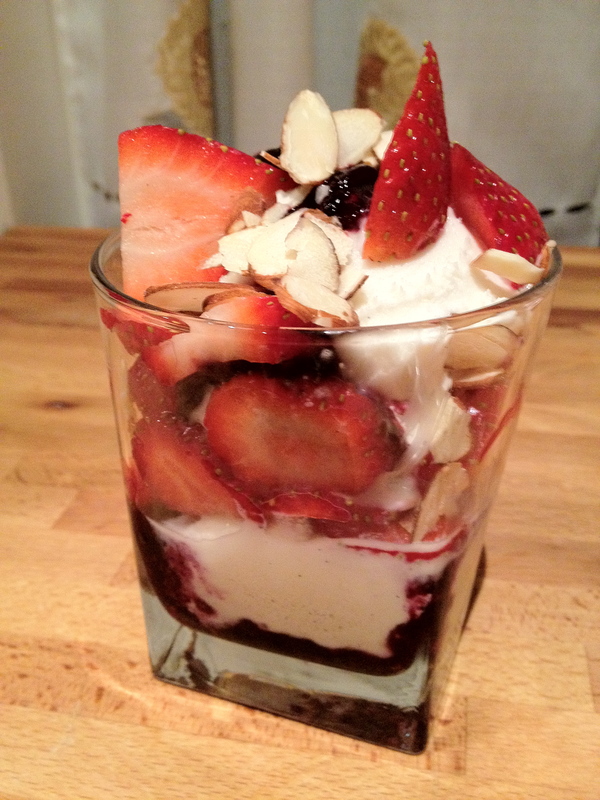 Use with fruit and frozen yogurt to make a parfait sundae (pictured). Spread on toasted wheat bread with a touch of butter. Spread on hot corn muffins, or any muffin. It’s delicious! 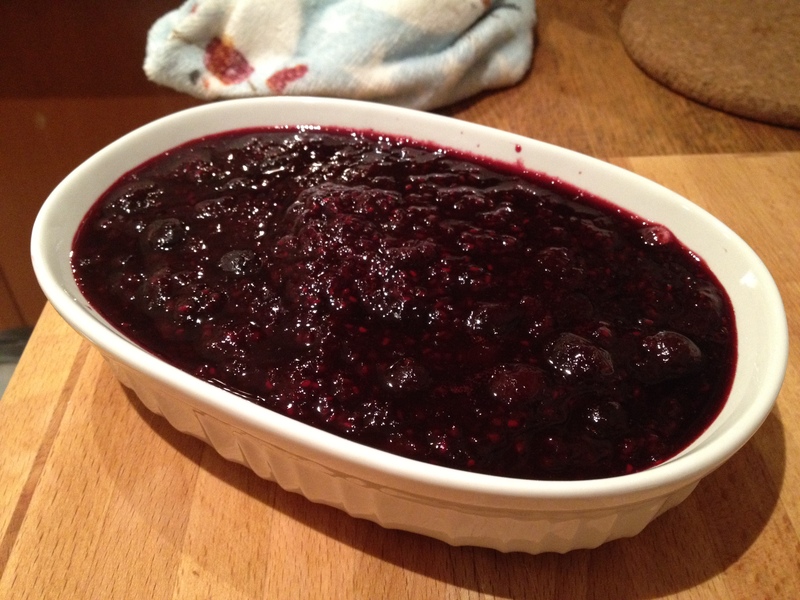 This entry was posted in Recipes, Sweet Tooth and tagged berry sauce, blueberries, cherries, dessert, frozen berries, fruit, grand marnier, honey, raspberries, recipes, strawberries, sweet, topping. Bookmark the permalink. My kids like berry sauce on pancakes–and I do too!